Plumbing systems can make some very strange noises; it’s even used sometimes as a cheap scare in horror movies. The loud gurgling and prolonged vibrating noises are nothing to worry about! This is simply an indication that there is air caught in your water pipes. A well pump unable to draw in enough water, causing it to send a mixture of water and air. Thankfully, fixing this kind of plumbing issue is an easy DIY project that shouldn’t require you to hire a professional plumber (unless you REALLY mess up somehow). Just follow these simple steps to “bleed out” those annoying air bubbles and stop scaring yourself from the loud noises behind the walls! Find your main water supply valve and make sure it is completely turned off. It should either be outside or inside, depending if you live in a warm or cool climate. To help get all the air out of your pipes, you want to turn on every faucet in your home or building (after you’ve shut off the water valve). Don’t turn the faucets on at full force, just enough to let the air escape. Basically, you want every faucet that has a water connection, including your washer and dishwasher, to be turned on. Start with the faucet that’s closest to the shutoff valve and work your way to the farthest faucet. Open each hot and cold faucet about halfway to let the air run out. Remember to flush all the water out of the toilets, too. Once all your faucets are turned on, including the outside spigots, turn the water valve all the way on. Let the water run through all of your faucets for 10-15 minutes to make sure you are seeing a steady stream of water, or aren’t hearing any noises coming from your piping anymore. For washing machines and dishwashers, pour in a cup of water and let the appliances run through a rinse cycle. A steady flow will indicate there is no more air in your water pipes. You can then turn off all your faucets by working your way back from the farthest to the closest faucet. Having air in your pipes will not damage your home or buildings plumbing system, so don’t worry! What people tend to confuse air in their pipes with is the possibility of a water hammer situation. A water hammer occurs when water traveling through the pipes quickly changes direction because someone turned a water valve or faucet too fast— forcing the water to go backwards into the piping system. 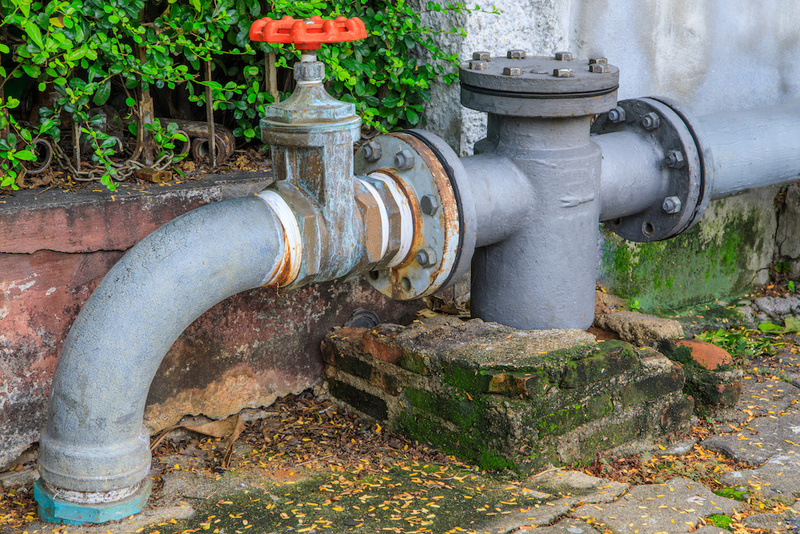 This can cause excessive pressure and damage your water system. If you are still experiencing plumbing issues or have low water pressure, it’s best to contact a professional plumber to make sure the problem isn’t more serious. Plumbers have the tools and the proper training to help identify existing plumbing issues and offer solutions to fix them. Contact Express Sewer today to learn more about our plumbing services and receive a 20% discount coupon when you try our services as a first-time customer!